SINN FÉIN Downpatrick councillor in Liam Johnston has called for an end to anti-social behaviour by youths in the Glebetown Drive area of the town. 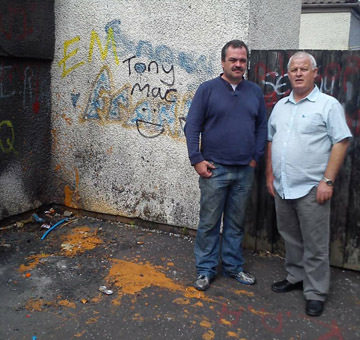 Councillor Liam Johnston with a resident at Glebetown Drive in Downpatrick who has experienced anti-social behaviour. Councillor Johnston said there has been an ongoing problem in the area and addedL “There have been a number of complaints to myself regarding youths gathering to the rear of the shop and houses on Glebetown Drive. “These young people are taking part in underage drinking, setting fire to fences, an causing loud noise and littering. “The residents in the area are at their wits end and quite simply want this to end. I have contacted Down District Council to ensure that the area is cleaned up and I will be raising the matter with the local Down Policing and Community Safety Partnership.